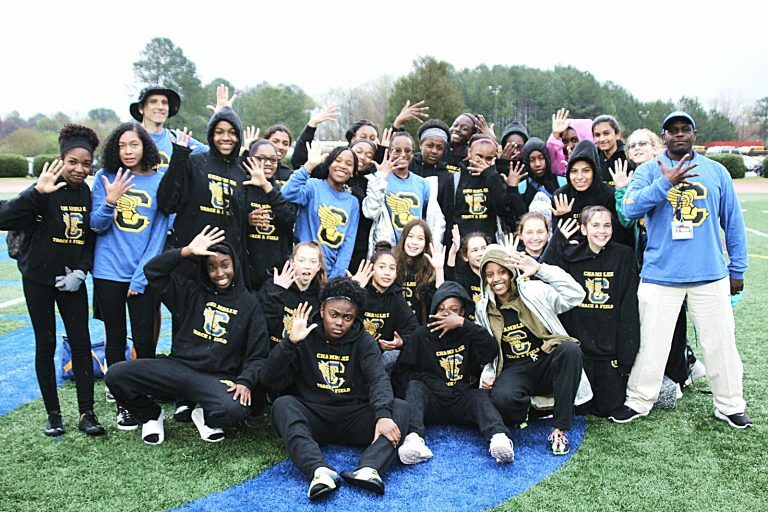 The Chamblee Lady Bulldogs retained their DCSD Middle School Track title with a convincing 96 to 56 win over the Lithonia Lady Bulldogs on Tuesday at Godfrey Stadium. It is Chamblee’s fifth title in the past 10 seasons (2009, 2010, 2012, 2017, 2018) as Jordyn Parker won the Most Valuable Girls’ Track Athlete Award by contributing 23.5 points to the team’s cause and Coach Terrance Jett was named Coach of the Year for the second consecutive year. Chamblee trailed Cedar Grove by one point after the field events and 1600 meter run on Saturday heading into the finals on Tuesday. The Lady Bulldogs opened the track finals with a gold medal in the 1600 meter sprint medley relay as on the legs of Keisha Hunter Ta, Cydney Bowe, Jai Jackson and Tabitha McLeoud with a time of 4:32.70. The title was clinched by the time the 100 meter dash was completed with Chamblee having 65 points at the time. A bronze in the 800 meter sprint medley and another gold in the 4×100 meter relay (50.57) by Mariah Craft, Parker, Jackson and Bowe had put the Lady Bulldogs on the road to the title. Parker finished second in the 200 meter dash (25.85) and fourth in the 100 meter dash (12.64) to go with her bronze medal finish in the long jump (15-09.00) wrapped up the MVP status. Cydney Bowe grabbed a silver medal in the 100 meter dash (12.33), Lilly Nicaruagua picked up a bronze medal in the 1600 meter run (5:59.44) and the 4×400 relay team took home the silver in 4:24.06. 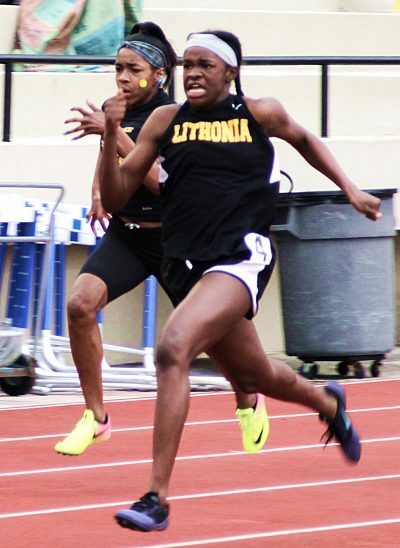 Lithonia’s second place finish was paced by Rusanek Tyler-Thompson’s record setting performance in the 100 meter dash, a win in the 200 meter dash and running a leg on the gold medal winning 800 sprint medley team. Tyler-Thompson broke Miller Grove’s Tiara Williams 100 meter record of 12.31 with a 12.26 in the prelims on Saturday and came back to break her own record with an amazing 11.92 in the finals on Tuesday. The time puts her 12th nationally in her age group. The Lithonia eighth grader made it a sweep of the two fastest sprint races by clocking a 25.24 in the 200 meter dash for the gold. She was 0.02 seconds shy of tying Tucker’s Mallory Hodge who set the 200 record in the prelims Saturday with a 25.22 to break Cydney Bowe’s record of 25.45 set a year ago. She teamed with Jamyia Wright, Caseyona Hight and Kailey Elliot to capture the 800 sprint medley gold medal with a time of 1:54.34. Tyler-Thompson also took home a silver medal in the girls’ long jump (16-06.00). Hight (1:02.14) and Elliot (1:02.47) finished second and third, respectively, in the 400 meter dash for Lithonia. Other individual gold medal winners include Tucker’s Hodge in the 400 meter dash (1:01.59), Taleah Casurra of Druid Hills in the 800 meter run (2:31.07), Abigail McHoul (5:39.76) in the 1600 meter run, Trinity Williams of Peachtree (16-09.00) in the long jump and Sydni Thomas of Freedom (33-08.00) in the shot put. The Champion 4×400 meter relay team of Aisha Anderson, Candace Taylor, Aubrey Guyden and Janiyah Alibey captured gold with a time of 4:18.65. 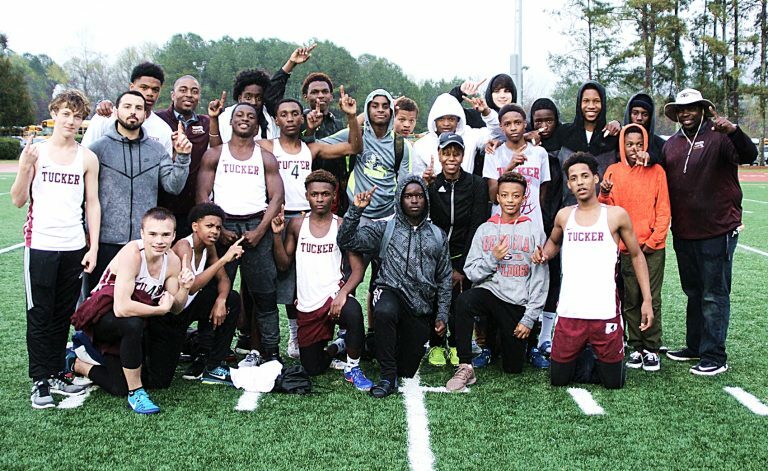 The Tucker Tigers made a statement with a new record in the 1600 meter sprint medley relay to take control of the boys’ championship on the way to an 84.50-54 win over defending champion Chapel Hill on Tuesday at Godfrey Stadium. Tucker had finished second the past two years, but now have three titles in five seasons under Coach Jermaine Walker including back-to-back in 2014-15. In second behind Bethune by 3.5 points heading into the track finals, the Tigers 1600 sprint medley team of Hassan Coleman, Joshua Morgan David Williams and boys’ MVP Abdul Kerebo ran a 3:58.94 to break Tucker’s own record of 3:59.45 set last year. The Tucker B relay team finished third to give the Tigers 16 points in the event and vault them into the lead for good. The Tigers had their 800 meter sprint medley relay teams finish second and fourth for 13 points and Joshua Morgan, who was a member of the 2017 record setting sprint medley team as well, added 10 more points with his gold medal winning performance in the 400 meter dash with a time of 55.12. Boys’ Track MVP Abdul Karebo totaled 20.5 points to lead the Tigers including the gold in the 800 meter run (2:11.05) and silver in the 1600 meter run (5:02.05). Tucker’s Denijil Nelson finished second to Kerebo in the 800 (2:16.59). Jacob Webb’s run to the gold in the 1600-meter run (5:01.89) and the 4×400 relay team (3:50.79) of Daniel Dorsainvil, Ke’Antae Thornton, Webb and James Carswell gave the Panthers two gold medals as they tried to defend their 2017 title. The Panthers picked up a silver medal in the 1600 sprint medley relay (4:05.37) to with three bronze medals including Webb in the 800 (2:17.87), Dorsainvil in the 200 meter dash (24.08) and the 4×100 really team (46.82). 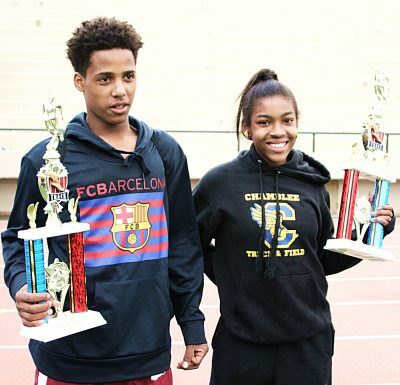 Bethune finished third with 41 points behind a win in the shot put by Janiran Bonner (42-01.50) and silver medals in the 1600 meter run by Emmanuel Clement (5:02.86), the 400 meter dash by Xavier Boyd (55.85) and the 4×400 meter relay (3:53.24). Lithonia picked up two gold medals at the meet including Elijah Hobson (19-03.00) in the long jump and the 800 sprint medley relay team of Antonio Davis, Jordan Hammons, Shemar Bradley and Hobson won their event in 1:44.47. Cedar Grove’s Eric Jordan was the gold medal winner in the 100 meter dash (11.46) and took silver in the 200 meter dash (23.97). Miller Grove’s Dylan Griggs picked up the gold in the 200 meter dash with a time of 23.66.